Those who have much are often greedy, those who have little always share. may the spirit of thanks and giving infuse our very essence today and every day. 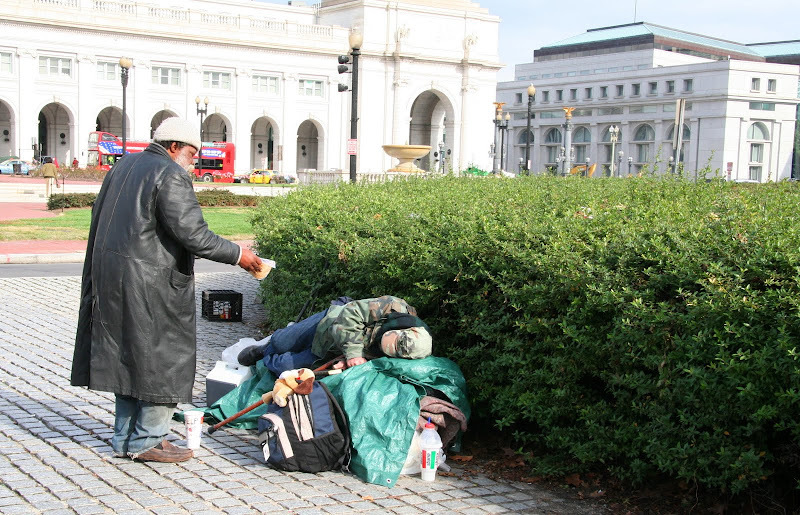 when I was thinking of the song to accompany this photo which captures one homeless fellow sharing a sandwich with another, I immediately thought of simple gifts. this song is one of my absolute favorite songs. the song was written in the mid 1800s by elder joseph brackett a member of united society of believers in christ’s second appearing (also known as the shakers). sometimes considered a hymn and other times it is viewed as a work song, for me this is simply a life song. it is one of the few songs that I never mind having stuck in my head. the song can make me smile and sometimes it brings me to tears - just like life. for that I give thanks. Gee, I recognize that video! I'm glad you liked it enough to use it. Have a good Thanksgiving. The seamless synchronicity of spirit that guided you to search for that particular version of the song that led you to Roy's piece is undeniable. Inspired. Thanks to you both this is truly a Thanksgiving gift! Beautiful work Roy. Thans Kim! That post was wonderful!Thanks for sharing. This is so so beautiful! Love the image, of course. Union Station is one of my favorite places in DC, and that incredible generosity - wow! And the song. It's so beautiful. I grew up singing that tune to a song called "Lord of the Dance." (Is this just a Presbyterian hymn? I'm not sure.) I think that this is the first time I've heard the original words, and I do find them much more beautiful . . . especially when sung by Allison Kraus's crystalline voice and with the accompaniment of Yo Yo Ma. The video was so beautifully done. A very good choice for sharing! Thank you. Wow that was a great catchup! Thanks to you I always leave here feeling a little more knowledgable, a little more content, and a whole lot more inspired!